#35 "ATOMSOUNDS", played by JACKIE MITTOO and that's exactly how it sounds! Heavy Reggae Sound, recorded between 1976 - 1978 at King Tubby's Studio in Kingston, Jamaica. This music is not really about who can play most notes/sec., but it creates a special mood, although it's advisable to play it very loud so that you can FEEL the Drum 'n Bass by SLY & ROBBIE and if you wish, with the stimulants of your choice. 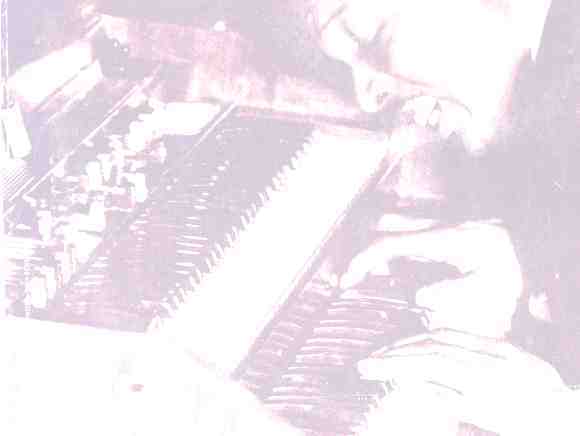 The organ sounds are made by either WINSTON WRIGHT or JACKIE MITTOO. "MERRY GO ROUND".For more about Jackie Mittoo click here. #36 This medley of 3 tracks from the CD "SHOW CASE " by Jackie Mittoo on the STRIKER LEE Label : CP 44 407-2 can serve both Reggae Haters and Reggae Lovers to cling to their opinions about Reggae Music, that either "it all sounds the same" or that "they all sound different". "A REVOLTING ROCKERS" and "HOTBLOOD"
#37 When sifting out my old LP's for Hammond sounds I came across this GEM, which I'm afraid I didn't play for the last 20 years or so, totally wrongly as you can hear when listening to this very strong jazz track, very aptly named "HAPPY FINGERS" from the LP "NEW IMPROVED FUNK" by GEORGE FREEMAN, featuring Von Freeman on tenor sax, with on this track BOBBY BLEVINS behind the organ and Marion Booker on drums. #38 Former "MysteryTrack 3" has been identified as "PRAYIN' FOR THE BLUES" by heavy Blues, Funk & Jazz organist "RON LEVY", playing as usual with his "WILD KINGDOM". He also made the Acid Jazz/Blues CD "Zim Zam Zoom". All of his CD's featuring very Hammond-centered music, quite logical of course, when you are the King........ He has his own company and Homepage here, including his gig's schedule (soon he'll be off to Brasil, lucky guy....). While taping this track from the radio it was abruptly followed by the Station-call of what used to be Radio London, an (in)famous pirate radio station that used to broadcast from a ship in the North Sea in the 60's. Some of you who live around the North Sea may have been listening to what was one of the first pop music stations in Europe and you might remember this nice little Hammond tune from the long nights listening to Radio London, trying to catch the latest hit-single or whatever... It is still used by Q-radio in Holland now. You can hear the last seconds of RADIO LONDON in the air HERE (in .wav format with the famous DJ John Peel). #39 Another Hammond solo that I taped from the radio is this "Funky Fusion" track, or maybe you know a better description for it? Could it be Medeski, Martin & Wood with John Schofield or something like that? #40 Ever since I heard this song "HELP ME" by "SONNY BOY WILLIAMSON" for the first time, more than 30 years ago, I have liked the organ part in it. I think it's a simple, but adequate style. Still I don't know who is playing it. Also it always reminds me of another tune which is very well known and discussed in Hammond circles. #41 Funky Hammond played by "WILL BOULWARE" on MACEO's cd "FUNK OVERLOAD". Cool version of Marvin Gaye's "INNER CITY BLUES", with Maceo playing his famous powerful sax. #42 From this same cd these two excerpts from "SING A SIMPLE SONG", a straightforward funky tune and "ELEPHANT'S FEET" , with a funny Hammond intro (if you ever wondered how an elephant would sound on a Hammond, here is the answer...). #43 When I first heard this CD "BLUES SPOKEN HERE"by DAVE SPECTER with "ROB WATERS" on Hammond B-3 I thought, "Well, not bad", but it turned out that the more I listen to the tracks, the more I like them, every time discovering something new.... "LISTEN HERE" ( I have nothing to add to this) with the peculiar voice of Lenny Lynn. #44 Subtle (Hammond, guitar, sax) sounds in "SEÑOR BLUES"
From CD: DELMARK 721 "BLUES SPOKEN HERE"
#45 "THE PEDDLERS". I never heard of this group until I read an article about them in the "Turning Wheel", the magazine of the "Hammond Toonwielorgelvereninging Nederland" or "Dutch Hammond Tonewheelorgan Society". The Peddlers, a British 60's - 70's pop group playing in their own style, but if anywhere might be put in this line: Arthur Brown, Joe Cocker, Georgie Fame & the Flames. Leading man in the Peddlers was "ROY PHILLIPS" being the organist and singer, playing a heavily modified A-100 (with wah-wah etc.). Roy seems to have disappeared from the earth's surface, although according to some rumours he is alive and well somewhere in New- Zealand. Two excerpts here from "LOVE FOR SALE" and "TELL THE WORLD WE'RE NOT IN". #46 The Peddlers with: "LAST TRAIN TO CLARKSVILLE"
#47 Two quite well known organists are doing a live version here of Bill Doggett's "HONKY TONK" playing on two B-3's provided by the "Swiss Cheese & Chocolate Co." at Montreux. #50 I came across this great new (1999) CD by Van Morrison "BACK ON TOP" . GERAINT WATKINS' mellow B-3 sound is a perfect match for VAN the MAN's always somewhat melancholic songs, very appropriate for this time of the year, there is even one song "When the leaves come falling down" on this CD, but in this clip you hear an excerpt from "HIGH SUMMER"
#51 Another track from this CD is "REMINDS ME OF YOU"
#52 Recently I received a lot of new Hammond sounds from fellow Hammond lover Ruddy from Belgium. This is one of his old vinyl singles, "GONZO" by JAMES BOOKER. "MILT BUCKNER", who is even singing here (well, something like it) in the classic "GREEN ONIONS". Very "dry" sound. GARTH HUDSON, who seems to have finally abandoned his Lowrey Organ for the real thing, the B-3 of course! Unfortunately the omnipresent egocentric guitar players on this CD have not left much space for Hammond Solos, but you can hear the typical whirling, bubbling organ playing of Garth in "ONE TOO MANY MORNINGS". The listener may be interested to know that "One Too Many Mornings", which Rick Danko, Garth Hudson and Levon Helm perform on this album, is a song The Band played with Dylan at all their 47 concerts they played together in 1966. #57 & #58 Another Grand Master of the Hammond is RICHARD "GROOVE" HOLMES. You can hear two clips, the first one "CATHERINE", again sent to me by PHill, who writes: "Catherine" which is kind of like a jazz-latin flavor with a lot of "groove effect" riffs Richard was famous for (from the "American Pie" album). The second clip "ME & GROOVE" comes from the album "SOMETHIN' SPECIAL" and features a nice duet with pianist Les McCann, who also composed the tune. With Clifford Scott on sax, Joe Pass on guitar and Ron Jefferson, drums. #60 The first Gospel clip is "TO MY FATHER'S HOUSE" by THE EDWIN HAWKINS SINGERS who became famous in the 60's when a DJ in Oakland cleaned up his house, found the song "Oh Happy Day" there and played it in his program, thereby unexpectly making it a hit. Actually you only hear half of the record, as I only taped the left channel to make the organ sound more clear. This first song is "I'LL FLY AWAY FROM HERE"
#62 Since this concert is called "A Tribute To Mahalia Jackson" her songs are performed here and "PRECIOUS LORD" is announced by a very emotional Mavis Staples who sang this song with "Miss Jackson" shortly before she passed away. a blues club owned by his father James.